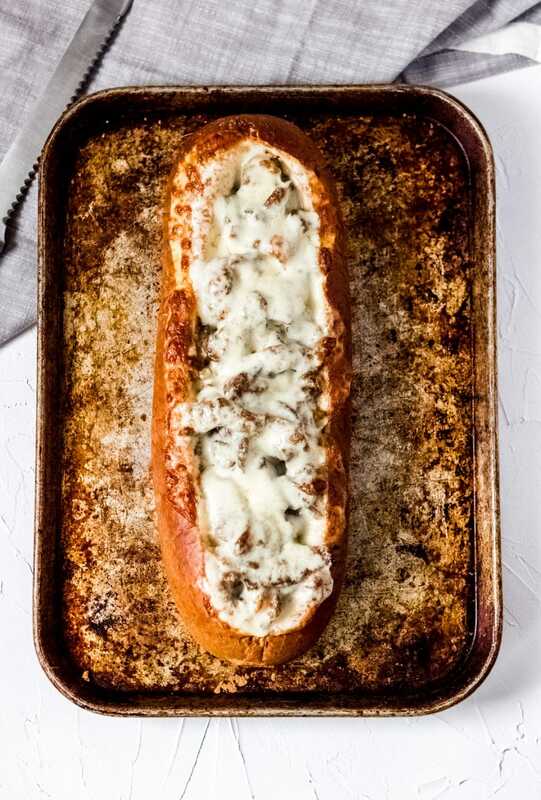 Gather your friends and family around and celebrate gameday with this Philly Cheesesteak Stuffed French Bread. This post is sponsored by the Certified Angus Beef ® brand in conjunction with a social media campaign through Sunday Supper LLC. All opinions are my own. I’ll be honest, I’m really into celebrating any game day just for the appetizers. Who’s with me?? Nothing beats a plate full of appetizers and a cold drink while you cheer on your favorite team. 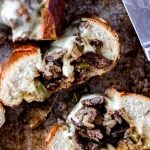 This Philly Cheesesteak Stuffed French Bread will definitely be a crowd pleaser at this year’s game day celebrations. What was on the original Philly Cheesesteak? The original Philly Cheesesteak consisted of a thinly sliced sautéed ribeye beef and melted cheese on a long roll. Originally the cheese of choice was Cheese Whiz, but it has been adapted to also using provolone cheese. 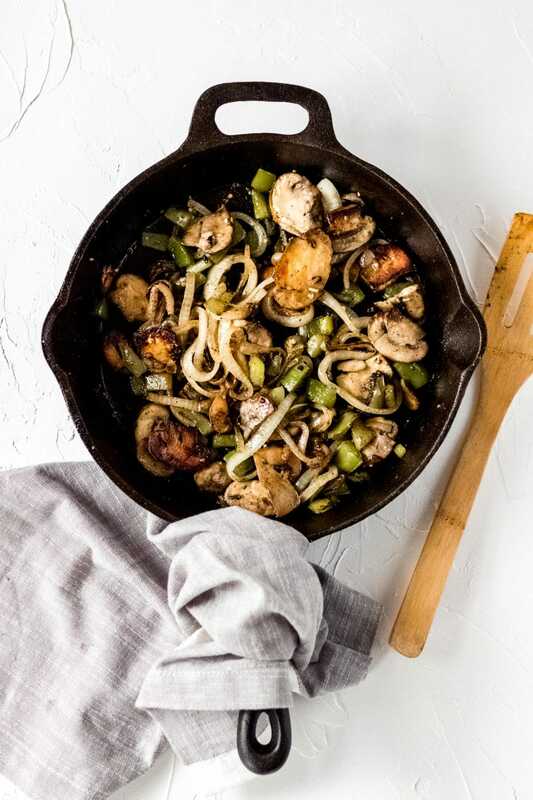 Additionally, many variations include sautéed mushrooms, onions, and peppers. What cut of meat is best for Philly Cheesesteak? I recommend using ribeye steak for your Philly Cheesesteak Stuffed French Bread, and for the best quality, I would suggest using Certified Angus Beef ® brand steaks. While other beef labels may say Angus, only Certified Angus Beef ® brand holds their beef to 10 science-based specifications for quality. 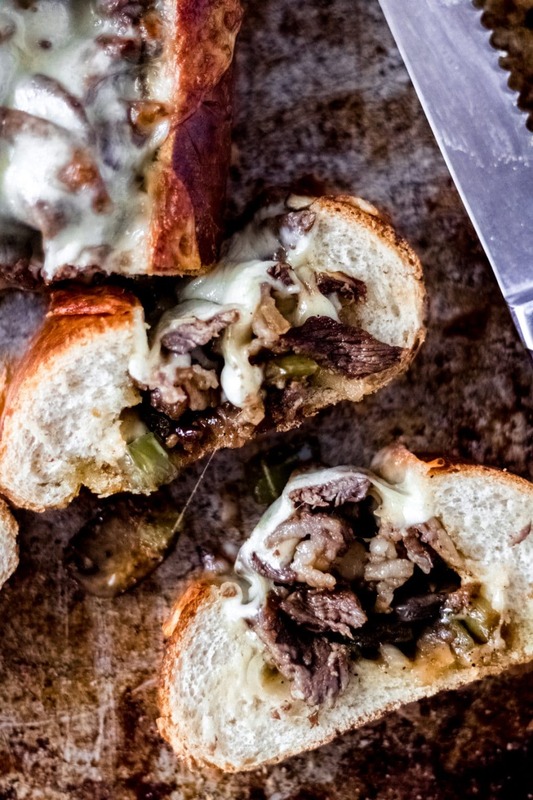 How do you make Philly Cheesesteak Stuffed French Bread? 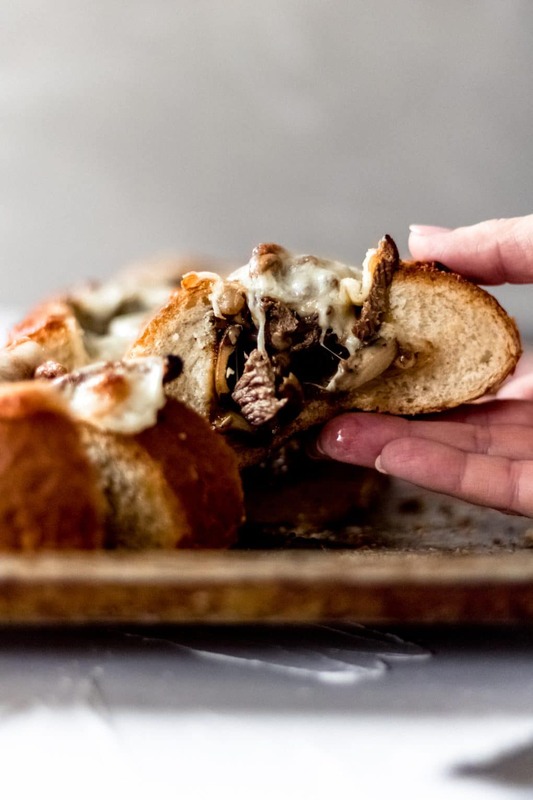 Putting together your Philly Cheesesteak Stuffed French Bread is super simple. 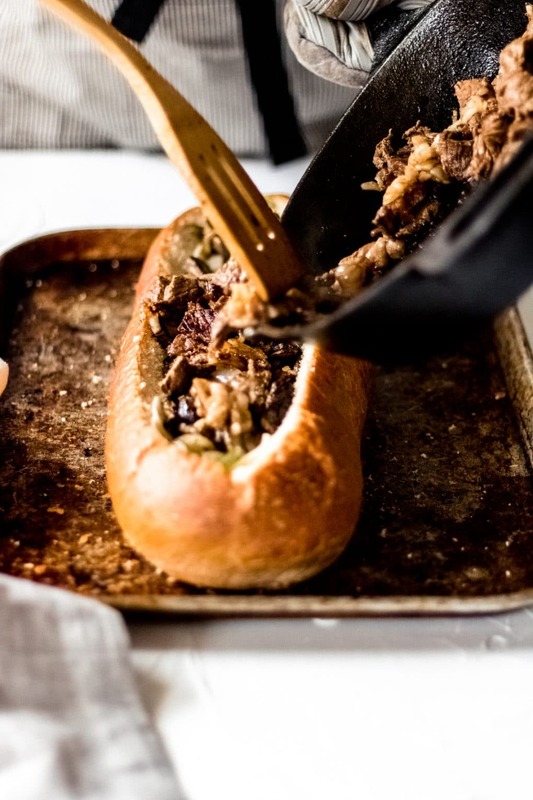 Before you begin cooking, cut out the center of the loaf of French bread so that you have a nice pocket for the Philly Cheesesteak. Line the bottom of the bread with provolone cheese. Next, you’ll sauté your mushrooms, onions, and peppers with a little olive oil and minced garlic. Once they’re done, transfer to the loaf of French bread on top of the Provolone cheese. 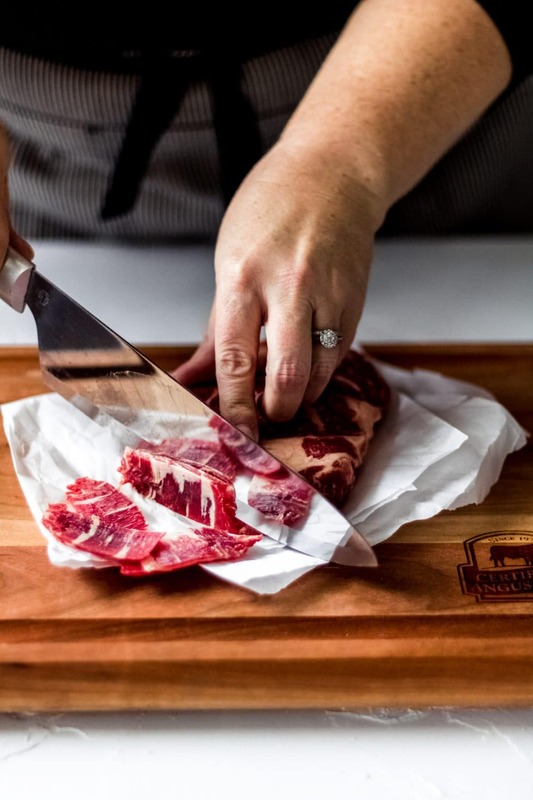 For the steak, you want very thin slices to make it easier to eat, and the easiest way to thinly slice your steak is to pop it into the freezer for about 1 hour prior to slicing. This will freeze the steak long enough to make it easy to thinly slice. 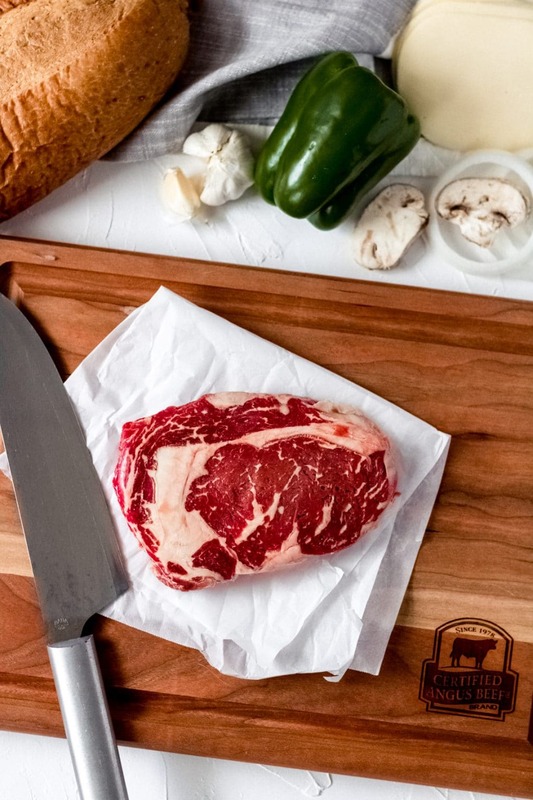 After you’ve sliced your steak, you’ll sauté your beef with a little Worcestershire sauce for just a few minutes, long enough to cook it to about medium. Once it’s finished, transfer the cooked steak to the loaf of French bread, on top of the sautéed vegetables. Top with 1-2 layers of Provolone cheese, depending on how cheesy you’d like your Philly Cheesesteak Stuffed French Bread, and pop it into the oven for 15 minutes. Remove from oven, let sit for about five minutes, then slice and serve. 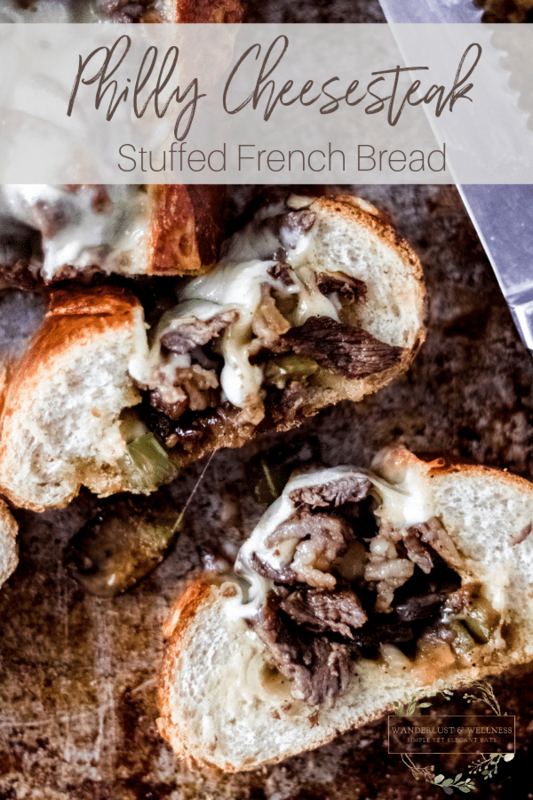 Serve up this Philly Cheesesteak Stuffed French Bread at your next game day gathering! Your guests will definitely come back for more! Place the ribeye steak into the freezer for 1 hour before slicing. Cut out the center of the French bread loaf so that you have a deep pocket. Line the bottom of the bread with 3-6 slices of provolone cheese. Set aside. In a skillet, heat the olive oil over medium-high heat. Add the onion, green pepper, mushrooms, minced garlic, salt, and pepper. Sauté until the vegetables are tender, then transfer the vegetables into the French bread loaf on top of the Provolone cheese. Remove ribeye from the freezer and thinly slice. Add the steak to the skillet along with the Worcestershire sauce and cook for about 3-5 minutes or until cooked to about medium, stirring occasionally. Note that some pink coloring is fine. Transfer steak to the French bread loaf, on top of the sautéed vegetables. Top with 1-2 layers of Provolone cheese (about 6-10 slices). Place French bread loaf onto a baking sheet and bake for 15 minutes or until the cheese is completely melted. If you’d like the cheese golden brown, you can switch it to broil for the last two minutes, watching carefully so that it does not burn. Remove from oven, let cool for about five minutes, then slice and serve immediately. If you love appetizers, check out these!